Real Madrid fans have voted in large numbers predicting that Chelsea forward Eden Hazard will be Zinedine Zidane’s priority transfer target. As you can see in the poll below conducted by Marca, Hazard leads the way with a huge 54% of the vote in a poll also including big names like Paris Saint-Germain star Neymar, Manchester United midfielder Paul Pogba and Liverpool duo Mohamed Salah and Sadio Mane. Hazard has been strongly linked with Los Blancos for some time now, and with Zidane back at the Bernabeu it makes sense that speculation over his future is intensifying again. Don Balon claim the Belgium international has already spoken to Zidane on the phone and given him his word that he wants a transfer to Madrid this summer. And it’s unsurprising Real fans are confident he’d be a target for their returning manager following public hints in the past from both parties. 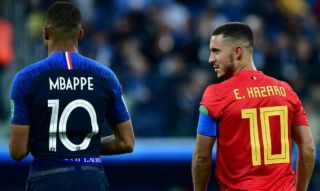 The Telegraph are among the sources to quote the pair expressing their admiration for each other, with Hazard describing the prospect of playing under his idol as a ‘dream’. Zidane, meanwhile, has been quoted in that piece as listing the 28-year-old as his favourite player after Lionel Messi and Cristiano Ronaldo.